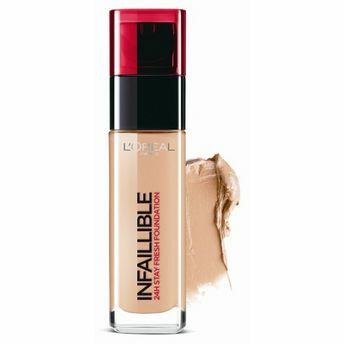 The Infallible Reno Liquid Foundation by L'Oreal Paris is a zero compromise foundation with 24 hour stay and maximum coverage. It is totally touch proof, resists extreme humidity and erases imperfections without drying out skin. This foundation's texture is perfect for brush application. It glides over the skin, sets effortlessly and delivers ultimate coverage without a layered effect. Explore the entire range of Foundation available on Nykaa. Shop more L'Oreal Paris products here.You can browse through the complete world of L'Oreal Paris Foundation .Alternatively, you can also find many more products from the L'Oreal Paris Infallible 24h Foundation range.